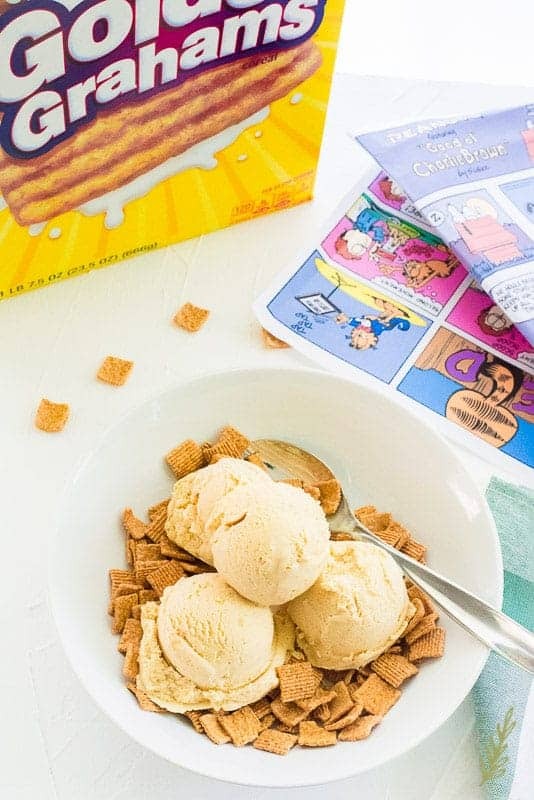 If you’ve never heard of Momofuko’s Milk Bar and Christina Tosi, then Cereal Milk is probably a new idea to you. Having deep New York City roots, I am very familiar with the Milk Bar craze. Obviously, Tosi did not “create” cereal milk- we all, at one time or another, have created our own version. 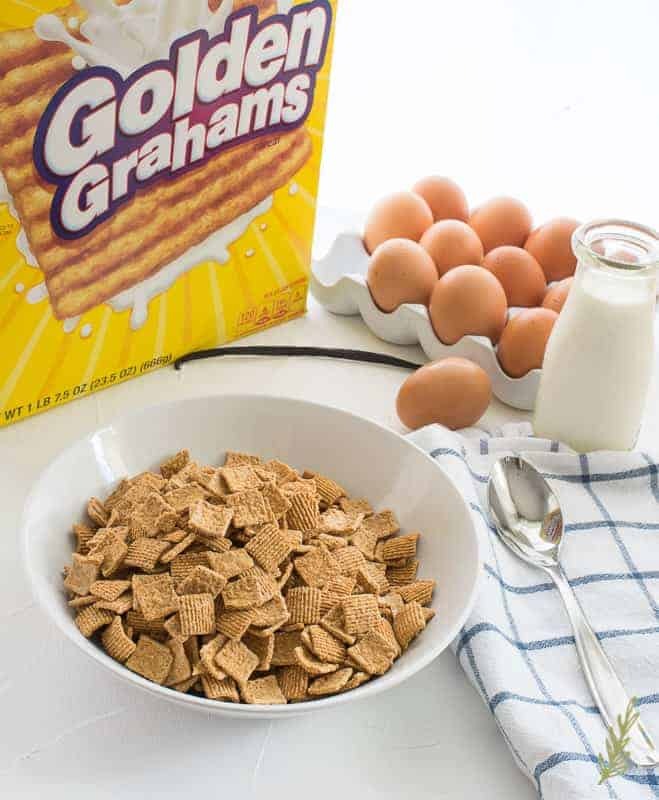 Cereal milk is just what it sounds like: milk that has been flavored by the cereal that was soaked in it. Unless your an odd-ball like my Twinks, you’ve had cereal milk more times than you can remember. My children, on the other hand, shunned cereal after their second time having it- so they don’t appreciate the creamy, rich flavor of cereal milk like their Pops and I do. Their loss.The Soldier’s was Frosted Flakes flavored; my cereal milk was definitely Golden Grahams-flavored. You probably had a totally different version. 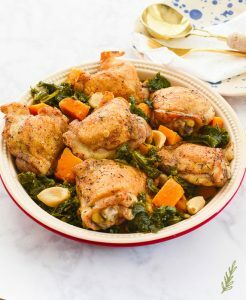 The great thing about this recipe is the ability to change its flavor just by switching the cereal you use. So, grab your favorite flavor and saddle up to the stove. You’ve been hanging out with me long enough to know that “regular” ice cream doesn’t jive here. I always take the extra five minutes to make frozen custard. Frozen custard is waaaaayyyyy tastier than frozen milk- it also sounds better. Cereal Milk frozen custard is just unspeakable in all of its glory. My frozen custard has a rich dairy base. Pull out a saucier (here’s a less expensive option from Calphalon), which has curved sides. Those sides will prevent any of your custard from clumping up in corners and scorching. 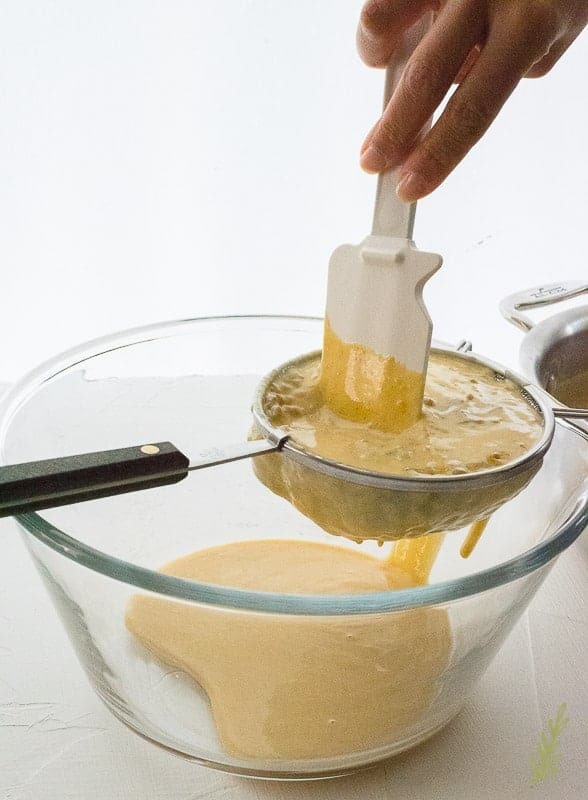 Scorching permeates the entire mixture, so no amount of straining will salvage your custard base once it’s burned. The saucier lowers the risk of that happening. It doesn’t eliminate it; it just cuts it down. Good old-fashioned attention will eliminate the risk, though. Heat the pan over medium heat on your stove and add the heavy cream. 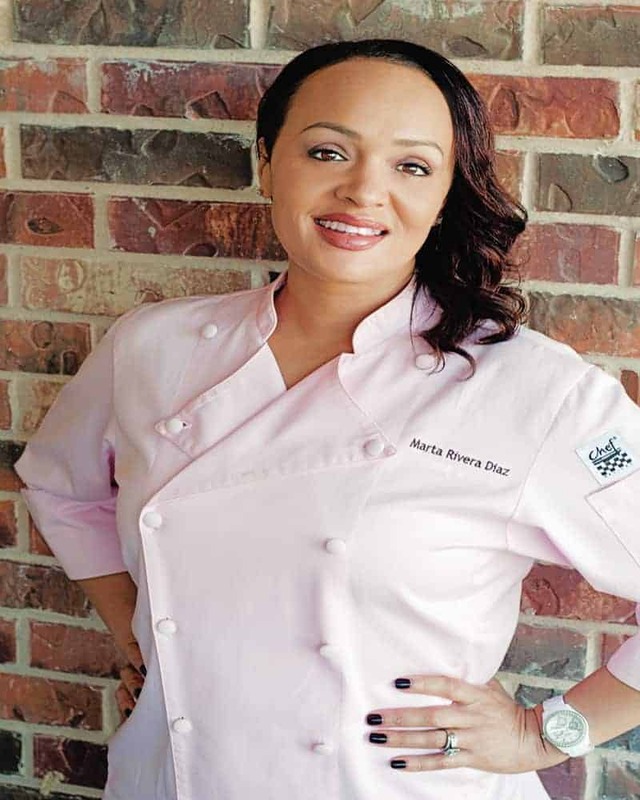 A frozen custard made with only heavy cream will not only clog your arteries, it is also extremely easy to churn to butter when you’re mixing it. Because of those reasons, we cut the cream with whole milk. Make sure you don’t try to use two percent or, God forbid, skim milk. 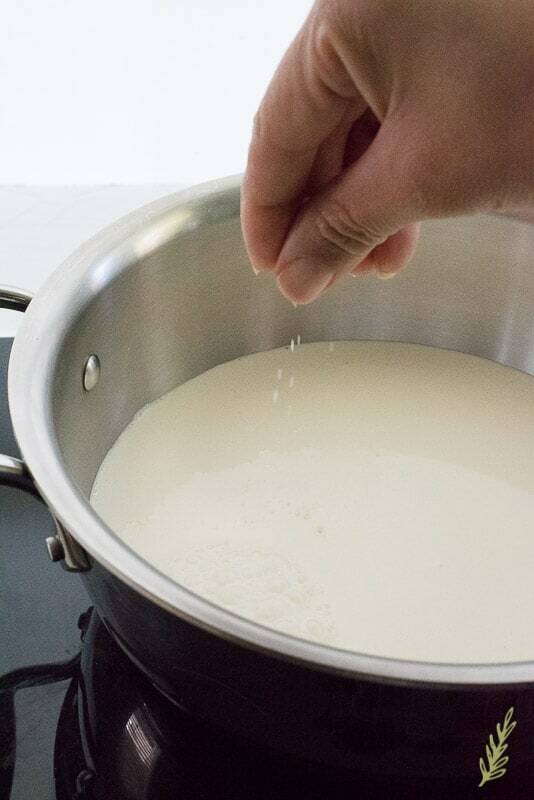 You need the fat in that milk to create the perfect mouth-feel in your cereal milk custard. Add the milk to the pan at the same time you add the cream. Give the mix a whisk to combine the milks together. One of the last ingredients needed for the milk base is vanilla extract. Because we want to flavor the custard mainly with cereal, we don’t add a large amount of vanilla. We do, however, need the vanilla to create the depth of flavor that makes any frozen custard amazing. After you add the vanilla, bring the milk base to a gentle simmer. You don’t want the milk to boil, so keep an eye on it. 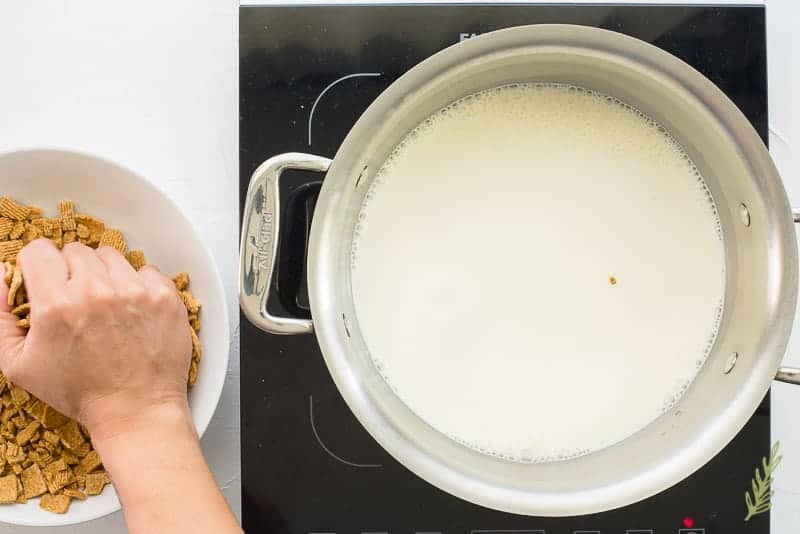 While your milk is coming to a simmer, crush your cereal into smaller pieces with your hand. You don’t need to get neurotic over it, you just want the cereal flakes to be somewhat crushed so they infuse the milk in the time we have. Once you see tiny bubbles on the rim of the milk and steam coming off the surface, turn the heat off. Add the cereal to the milk base. Whisk the cereal into the milk to distribute it throughout the liquid as much as possible. 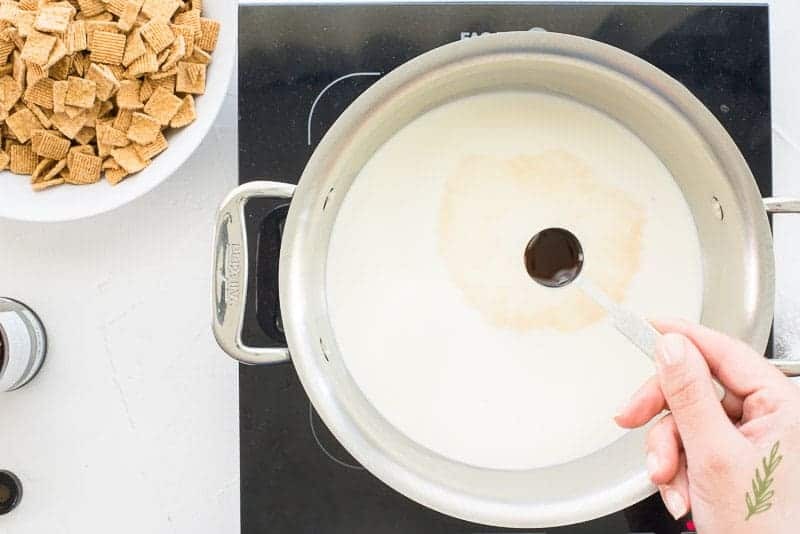 Allow the cereal flavor to infuse the milk for fifteen minutes. You can leave it on the stove, but make sure it’s off the burner, as the burner will still be hot. While your cereal is infusing, combine the egg yolks and sugar in a medium-sized mixing bowl. Use the same whisk you used to mix the cereal into the milk, ’cause ain’t nobody got time for all them dishes. 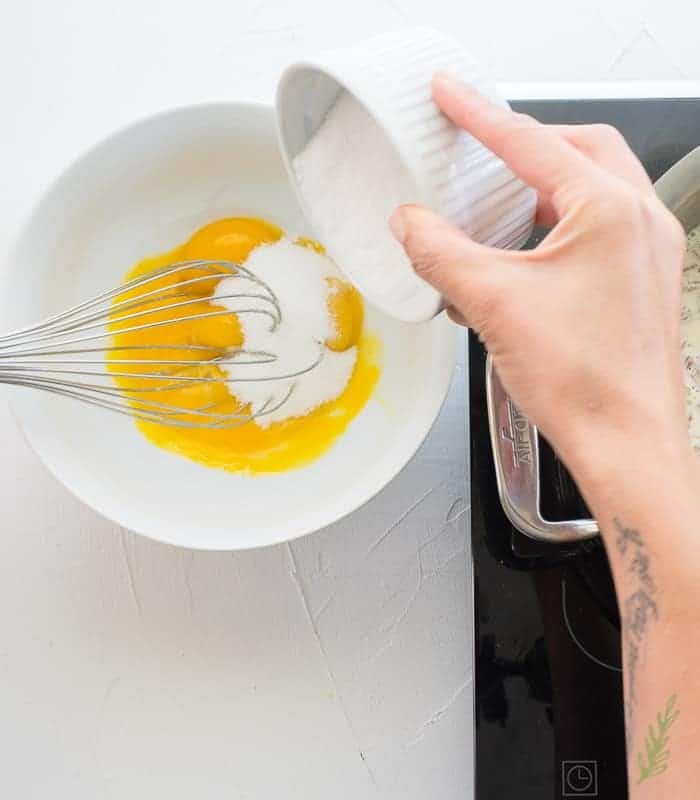 Whisk the eggs so the sugar is dissolved and the eggs take on a lemony-yellow color. When you lift the whisk from the eggs, the run off should leave a “ribbon-like” pattern in the eggs. This should take about four minutes. Once the fifteen minute infusion time has elapsed, return the milk to the stove and heat, over medium heat, until you see the milk steaming (about four minutes). Once the milk has begun steaming, use a one cup ladle, or a measuring cup, to carefully scoop out some of the hot milk mixture. Gradually bring the eggs to the same temperature as the hot milk by whisking the milk into the eggs in a slow trickle. Don’t be a hero and think you can just dump the whole cup of hot milk into the eggs. That’s not gonna do anything but leave you with sweet scrambled eggs. The slower the better, and whisk, whisk, whisk! 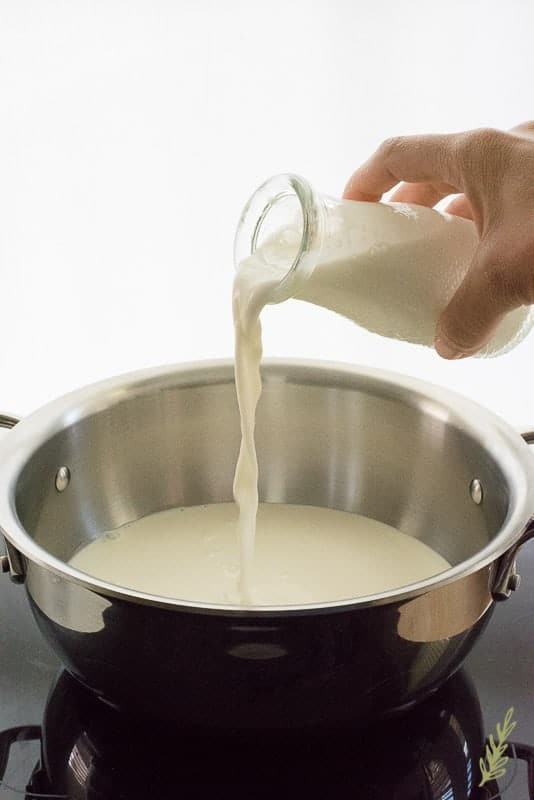 After you’ve added all of the hot milk from the measuring cup or ladle, reintroduce the milk-egg mixture to the milk in the pot in the same way. Slow and steady beats out fast and lumpy. 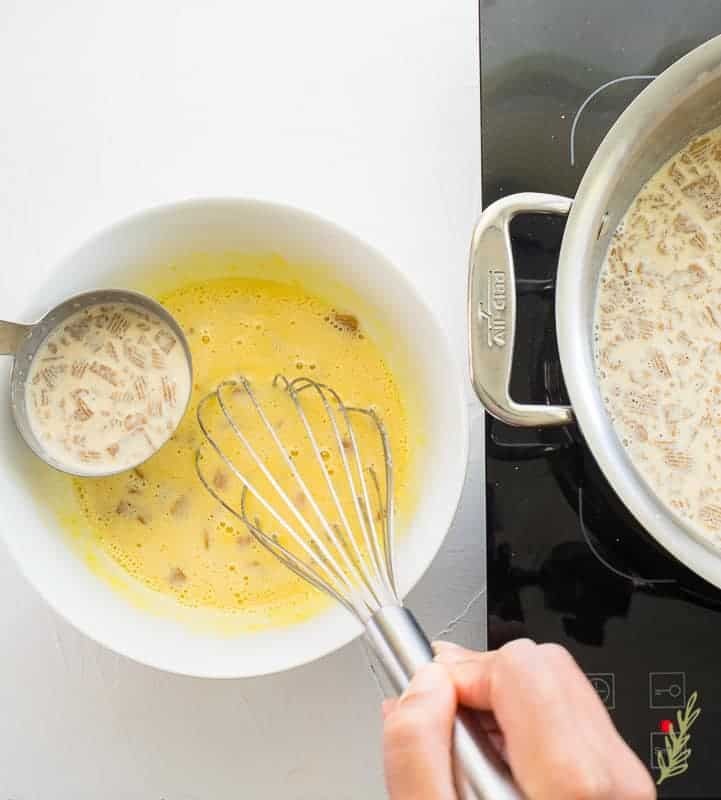 This process- called tempering- allows your thickener (the eggs), to slowly acclimate to the hot milk you’re going to add it to without having them coagulate. Once you’ve added all of the milk-egg mixture to the hot milk in the pot, whisk to combine. 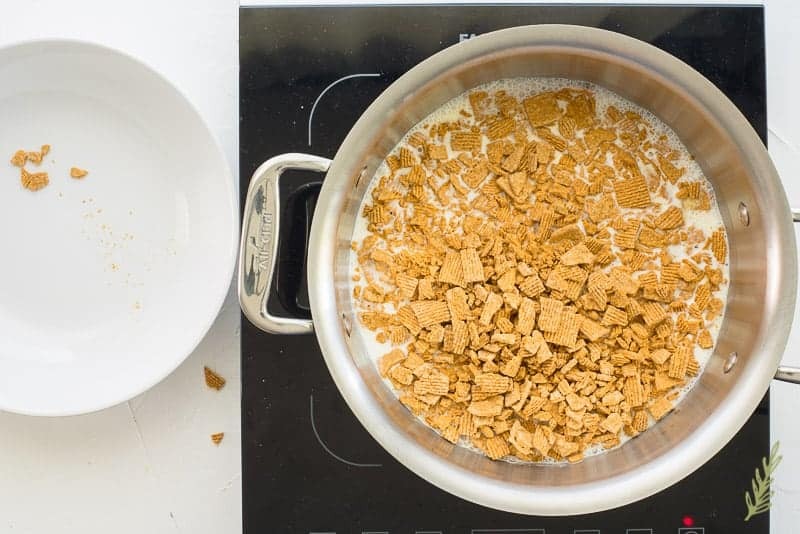 Allow the cereal milk custard base to cook for three to four minutes, or until the mixture thickens to the consistency of ketchup. Don’t let it boil! The biggest bubbles you should see will look those on the outer rim of the pot in the image above- suuuuuuuuper small. The best test for proper thickness is the wooden spoon/finger test. Take a wooden spoon and dip it into the custard base. You should be able to draw your finger down the middle of the back of the spoon and the custard shouldn’t run into the divide. If it does, it needs to cook longer (whisk constantly to prevent lumps). If it holds, you’re ready for the second infusing time. Let the cereal milk custard base infuse for another ten minutes. Listen, we want this to taste as cereal-y as possible; and let’s face it: we’re all worth this effort because of how damned fabulous we are. After the second infusion time has come to an end, set a strainer on top of a medium mixing bowl. Don’t be a dork like me and use one of the smallest strainers you own, either. Laziness is a sin, y’all. Pour the custard base into the strainer to remove the big cereal chunks. Use a silicone spatula to scootch the cereal chunks around in the strainer. This will unclog the strainer and allow the custard to flow through. Let the custard cool to room temperature before covering with plastic wrap and refrigerating until completely cold. This step should take up to four hours, but I prefer to age my custard overnight. This step is vital for that full-bodied, frozen custard taste. It also prevents any ice crystals from forming once you begin churning. If you make it the evening before you want to eat it, it gives you just the right amount of time to cool, and age, perfectly. Once you’re ready to churn, pour the custard into your ice cream maker and churn according to the manufacturer’s instructions. This process usually take twenty to twenty-five minutes. When the ice cream is a soft-serve consistency, you can eat it as is; or you can transfer it into an ice cream storage container and freeze for two to three hours for a frozen custard with a firmer consistency. Serve yours with crushed cereal on top, or on its own. 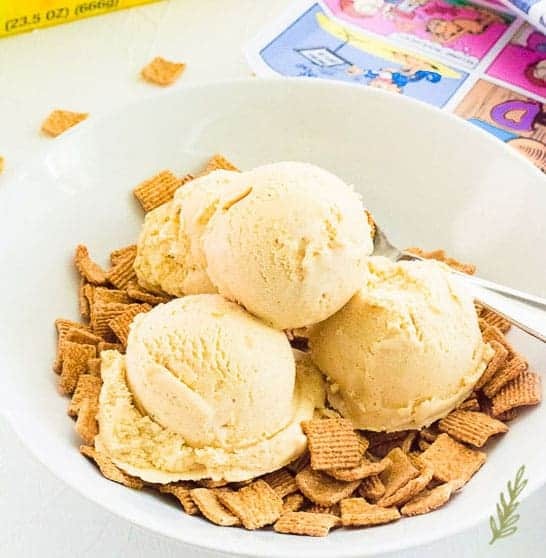 There’s nothing like Cereal Milk Frozen Custard that takes you back to the days when life was simpler. Pin this recipe for those days when you want to remember what living life tax and debt-free felt like. And don’t forget to share with your world. 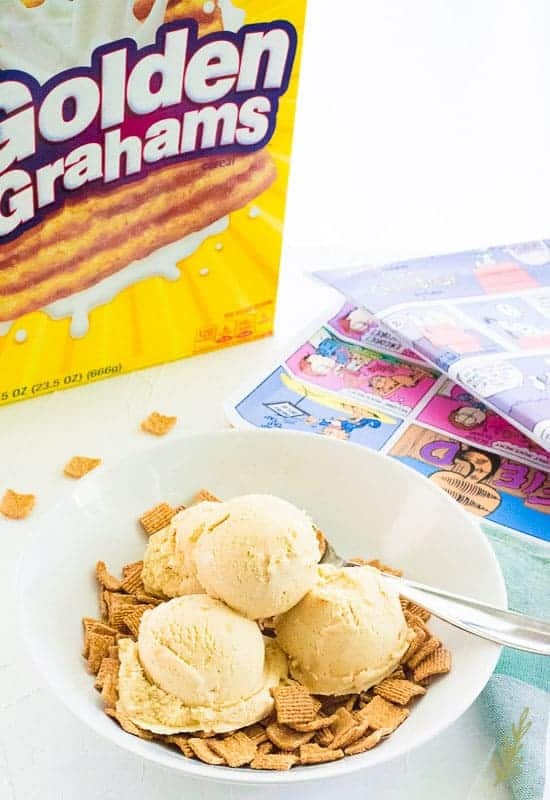 Use your favorite cereal to create this nostalgic frozen confection. 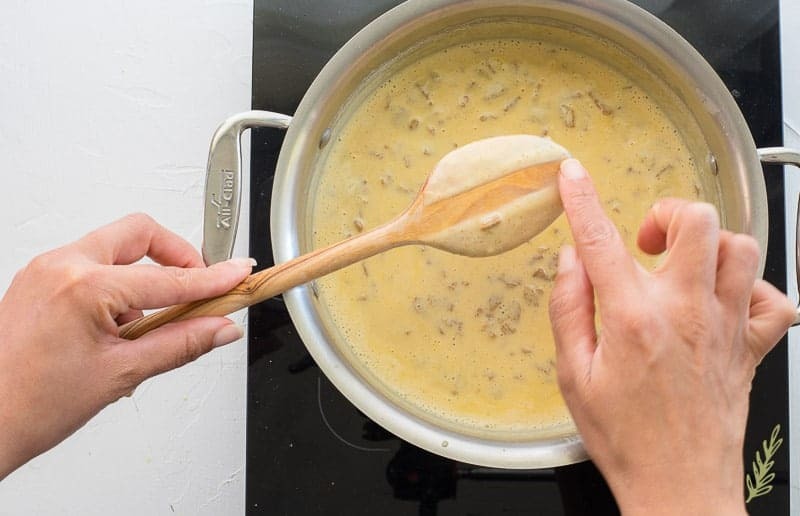 In a medium-sized saucier, or similar pot with curved sides, heat the heavy cream and milk over medium heat. Give the mix a whisk to combine the milks together. Add the salt and vanilla extract, and bring the milk base to a gentle simmer. Avoid allowing the mix to boil. Once you see tiny bubbles on the edge of the milk, and steam coming off the surface, turn the heat off. Add the cereal to the milk base. Whisk the cereal into the milk to distribute throughout the milk as much as possible. Allow the cereal to infuse into the milk for fifteen minutes. 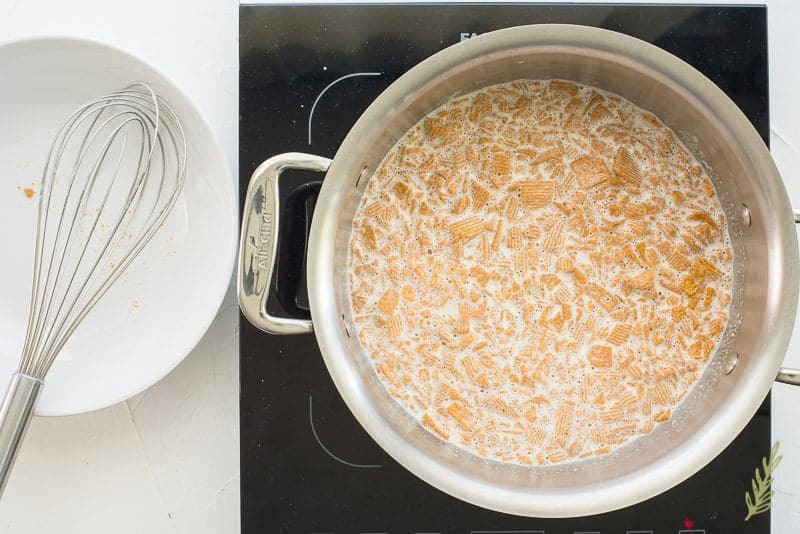 While your cereal is infusing, combine the egg yolks and sugar in a medium-sized mixing bowl. Whisk the eggs so the sugar is dissolved and the eggs take on a lemon-yellow color. 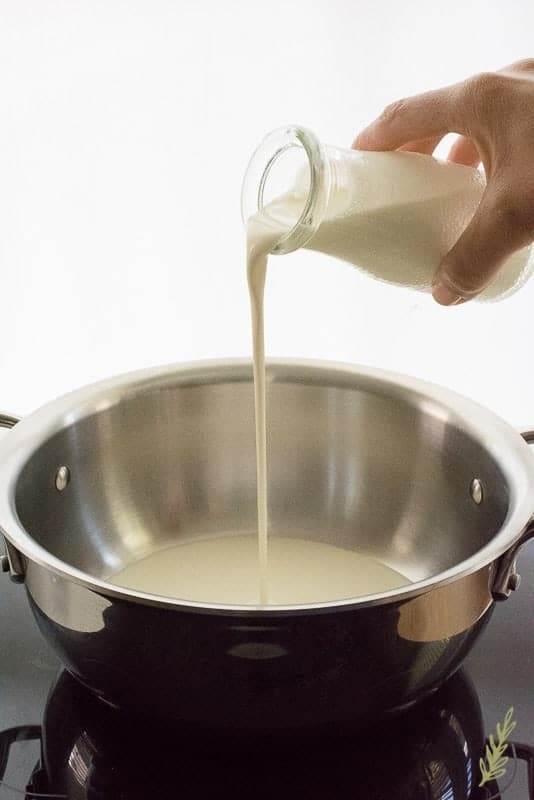 Once the fifteen minute infusion time has elapsed, return the milk to the stove and heat, over medium heat, until you see the milk steaming (about four minutes). Once the milk has begun steaming, use a one cup ladle, or a measuring cup, to carefully scoop out some of the hot milk mixture. 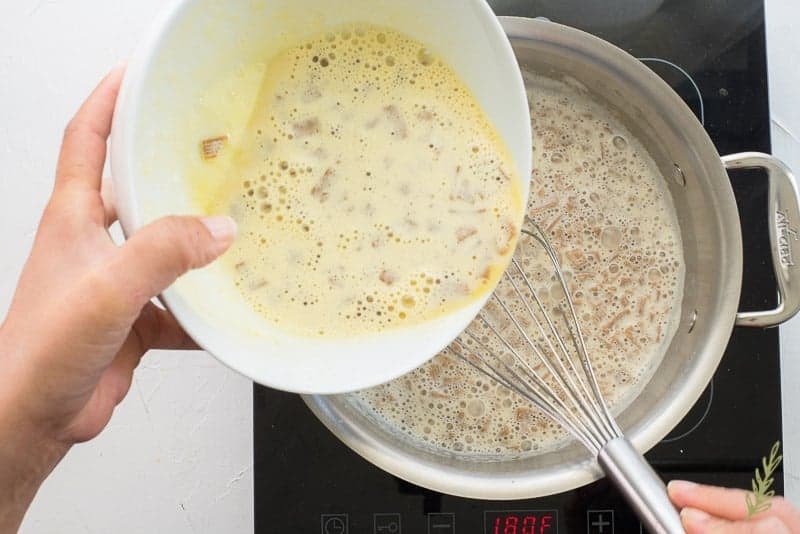 Gradually whisk the milk into the eggs in a slow trickle. After you've added all of the hot milk, reintroduce the milk-egg mixture to the milk in the pot in the same way. Once you've added all of the milk-egg mixture to the hot milk in the pot, whisk to combine. 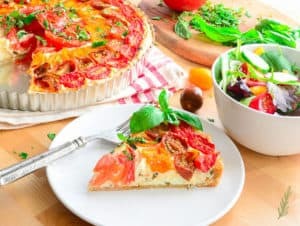 Allow the cereal milk custard base to cook for three to four minutes, or until the mixture thickens to the consistency of ketchup. Don't let it boil! Take a wooden spoon and dip it into the custard base. You should be able to draw your finger down the middle of the back of the spoon and the custard shouldn't run into the divide. If it does, it needs to cook for 2 minutes longer (whisk constantly to prevent lumps). 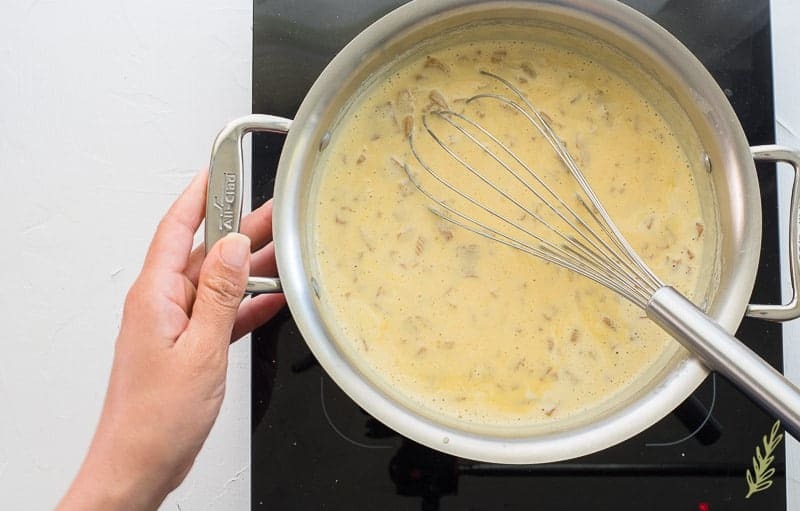 Remove the pot from the stove, and let the cereal milk custard base infuse for another ten minutes. After the second infusion time has come to an end, set a strainer on top of a medium mixing bowl. Pour the custard base into the strainer to remove the big cereal chunks. Discard the cereal. Let the custard cool to room temperature before covering with plastic wrap and refrigerating until completely cold. Refrigerate from 4-24 hours. Once you're ready to churn, pour the custard into your ice cream maker and churn according to the manufacturer's instructions. When the ice cream is a soft-serve consistency, you can eat it as is, or you can transfer it into an ice cream container and freeze for two to three hours for a firmer consistency. Serve with, or without, extra crushed cereal on top, or on its own. The frozen custard should keep for up to two weeks in the freezer. This is to die for, Aditi! I had a hard time sharing with my family. Wow – this looks amazing! I know my kids would go crazy over this as a dessert or as breakfast! Thanks for sharing! Dessert for breakfast, Meredith?!?! You’ll win mom of the year!! Well this looks easy to nake. Plus looks delicious too. Try it, Veronika! I think you’ll enjoy it. It’s so much better than boring ice cream. This looks like something my kids would really love. I am going to have to give this a try. Oh my. This looks awesome! I love your presentation of putting the custard on top of the cereal, great mix of textures! Thanks, for noticing that, Julie! I try to have a good time with the food styling. This sounds amazing! I’ve always loved cereal milk! Now my youngest son is following in my footsteps and always drinks his cereal milk after he eats the cereal. I will have to make this for us! You must be so proud, Julie! I wish our babies liked cereal. Thanks so much, Paula. I was inspired my Christina Tosi’s frosted flake version. Thanks, Mimi! I hope you enjoy it as much as I did. We try to go to Milk Bar every time we’re in NYC. Love their cereal milk soft serve. 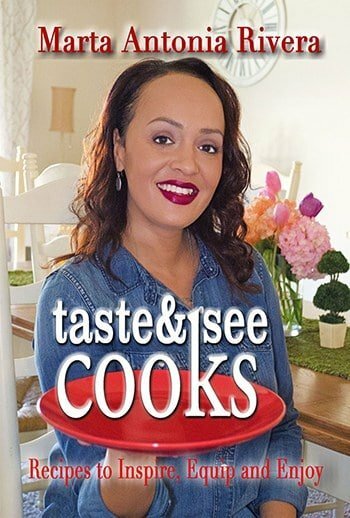 This recipe looks bomb! Every time I went they had insane lines, so I just decided to make my own, Jenni! LOL!! She’ll definitely appreciate it! I know I SURE did, Rai!